According to The Nation, the Kano State Police Command has confirmed arresting two women and three men trying to buy votes in the disputed Gama ward in Nasarawa local government area of Kano state. 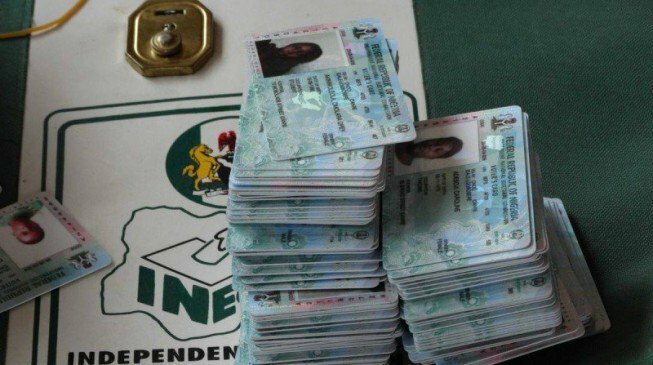 The Nation reports that two women were arrested for allegedly buying Permanent Voters’ Cards (PVCs) from housewives at the sum of N5,000 in Gama ward. Confirming the arrest in a statement Wednesday, DSP Abdullahi Haruna Kiyawa, spokesman of the police command gave the names of the two female suspects as Sa’adatu Ismail, 39 years and Halima Abba, 55 years, residents of Brigade and Tal’udu quarters respectively. “On 12/03/2019 at about 2000hrs, based on credible information received, two women namely (1) Sa’adatu Ismail 39yrs old of Brigade Qtrs and (2) Hajiya Halima Abba 55yrs of Tal’udu Qrts Kano were arrested for purchasing Permanent Voters Card from unsuspecting Voters at Gama Qrts Nassarawa LGA at prices starting from N500.00k and above. 8 Permanent Voters Cards and cash sum of N10,000.00k were recovered from them,” the statement said. Kiyawa also added that two other suspects, Mukhtar Suleman and Idris Dankanawa were also arrested in after they were found moving around Gama ward apparently to purchase PVCs. He said the suspects were almost lynched by a mob before they were rescued and subsequently arrested. The police spokesman said another suspect Mukhtar Shuaibu was also arrested for allegedly buying two PVCs at N3,000 at Dandinshe Gabas area of Dala local government area of the state. “Investigation is going on to unravel all person or persons connected to the crime with view of prosecuting them in the Court,” he said. He advised people to desist from selling and/or buying PVCs, saying the practice is an offence punishable under the Electoral Act. “Any person found to be engaged in the act should be promptly reported to the nearest Police Station for arrest, investigation and prosecution accordingly,” he said. Meanwhile, DSP Kiyawa also debunked rumours that the state commissioner of police Mohammed Wakili has been transferred from Kano, describing the rumours as “handiwork of mischief makers”. “Rumours going viral especially on social media that the Commissioner of Police Kano State, CP Wakili Mohammed has been transferred away from Kano, it’s not true. He is still the CP in Kano State. “Members of the public are advised to shun the rumours and consider it to be the hardwork of mischief makers,” .